We are delighted to confirm the date for the Shrewsbury Town in the Community Summer Cup 2019 as the 31st August. Last year’s event was a massive success with over 60 teams competing across all age-groups, travelling in from three different counties and beyond. Shropshire, Herefordshire and Worcestershire were all represented as the sun shone over our scenic South Shropshire Hub providing a fantastic weekend for all involved. 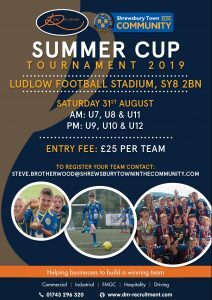 This year’s event will now take place as a 1-day feast of Football at Ludlow Stadium, with the U7s, U8s and U11s competitions taking place in the morning, and the U9s, U10s and U12s, tournaments running in the afternoon. The Summer Cup is open to all grassroots football teams in the relevant age groups to enter, with a £25 fee per team with free entry for parents, friends and family. Be quick as places are limited and operate on a first-come-first-served basis. Click here to see the full report from last year’s event.